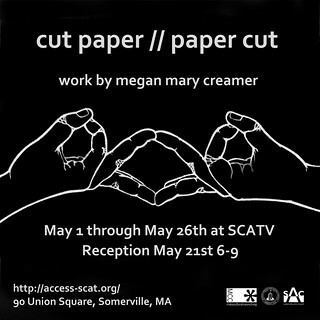 My work will be up at SCATV from May 1 through May 26th at SCATV. Come hang out with me and talk about art at the reception May 21st from 6-9PM at the SCATV building in Union Square Somerville. “Cut Paper // Paper Cut” is showing work from 2 series I have been working on, looking at old memories and working hands. If you didn’t get a chance to stop by SOS, this is a great time to come see what I have been up to over the past year. You can also check out this video the first interview I have ever done and it was both really fun, and hard to get through due to my terrible allergies! This work is funded by a grant from the Somerville Arts Council and the Mass Cultural Council. Thank you to everyone, especially Janet Cormier and Wendy Blom at SCATV for hosting me this month.